What seems like just yesterday was actually was actually 2009. 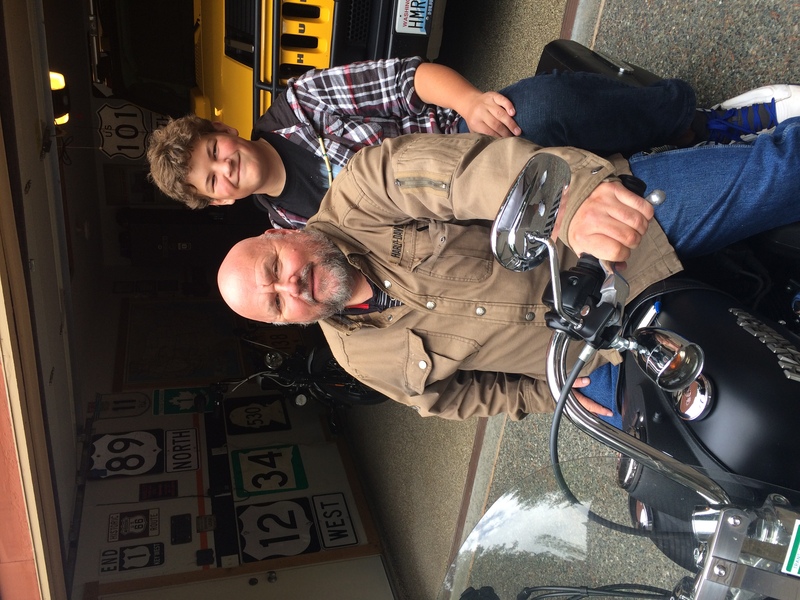 It was the first time I got a chance to take my best friend Dave's youngest son Ben on a motorcycle ride. I was on one of my cross-country trips and I'd stopped for a couple of days in the Bay Area of California where Dave and his family were living at the time. 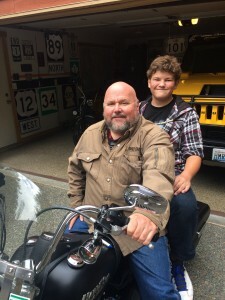 I'd never shown up at their house on a motorcycle before and his four kids were fascinated and I had a great time giving them all rides around the neighborhood and to and from school for the days I was there. But his youngest son Ben and I clicked in a big way. 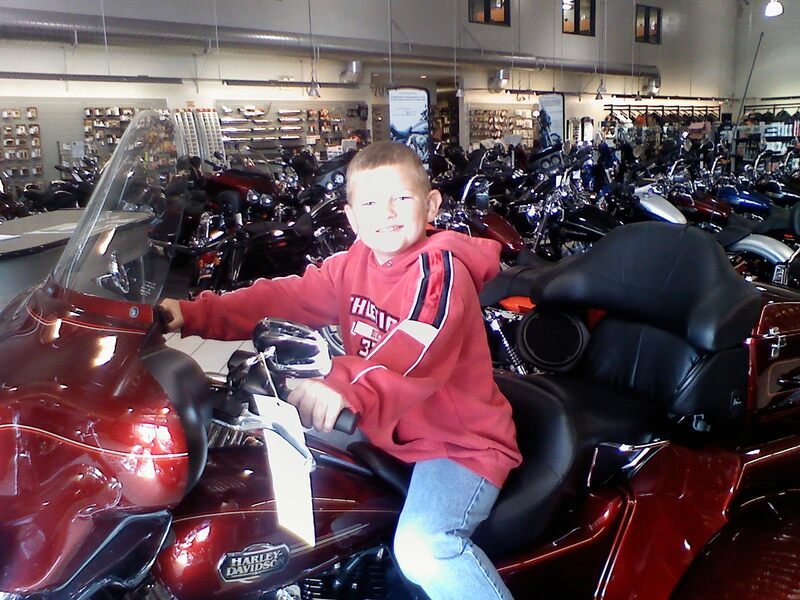 More than any of the other kids he loved going on rides with me, and so we did a long ride one day just the two of us. He's a wise kid, who's intelligence and conversation skills exceeded his age even back then. We spent an hour or so winding around the hills near Livermore and stopped for a break at the Harley dealer there to get some t-shirts. 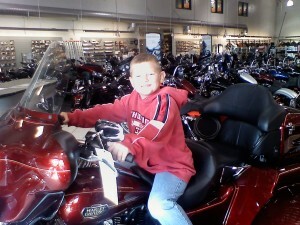 Ben spotted a few bikes he wanted and then bravely climbed up on a $39,000 Harley trike which caused a salesmen to get very nervous for a moment. I wrote about it here back then http://grgardner.livejournal.com/28343.html -- and even used it as fodder for a column in Quick Throttle. When I sent them a copy Ben was ecstatic that he was now "famous". At that time Ben was about 7, and he became my " lil buddy". Whenever I'd go see Dave and his family he was the one I spent the most time with and he loved talking about motorcycles and I'd give him Harley catalogues which he'd sneak into church in his Bible and read during the services. I gave him his own biker leather vest with biker patches, which his Mom says he didn't take off for weeks. They all moved to Salt Lake City a few years ago so I see them more than when they lived in California, but even still it's only once or twice a year. A lot can happen though in those short intervals. Kids grow up. Boy do they grow up. This past weekend Dave and Elayne and three of their four kids all drove up to Seattle from Salt Lake so they could take a week long Alaska cruise which left from here. They left their car with me and I took them to the cruise ship dock and picked them up a week later. The girls wanted to have breakfast at the Pike Place Market when they got back, but the boys wanted to chill at the house so we dropped the girls off at the market and Dave, his oldest son Joe, and Ben and I came back to the house to hang out. As soon as we got here Ben asked if we could go for a ride on Angus. And although the weather was not ideal, it was dry, and Dave said "Go for it", while he sat down with the paper and Joe laid on the couch playing video games. So we suited up and headed out, going for a loop around the neighborhood and down to the beach where we picked up a dozen donuts to bring back so they'd have snacks on the road. But it was clear that my 'lil buddy ain't so little any more. He's a young man. He towers over me. And his stature and demeanor often disguise his true age. I forgot that he's only 13, and jumped to the conclusion that he's taking drivers education and ready to start learning to drive. Truth is he still has one more year of Junior High left and another couple of years before he can drive. But even though he's older -- I guess he'll always be my 'lil buddy. When he was younger, I'd show people pictures of him and me and they'd ask if he was my son -- there was a slight resemblance in that we were both a little wider than we were tall. "No", I'd say, "he's not even a relative, he's my best friends Son." But if I ever did have kids, I'd like to think they'd grow up as great as my 'lil buddy Ben has. Smart, slightly rebellious, not afraid to laugh and have fun, and even throw out a cuss word or two at bad drivers just like I do. But did he have to get so tall? I'm glad though that unlike Jacky Paper who outgrew Puff the Magic Dragon, my buddy Ben hasn't outgrown going for a ride with his "uncle". I hope he never does.